Light Gels by Wybron: We Ship all Standard Gels within 24 Hours. Wybron offers two standard types of 16 frame light gels. Our theatre scroll contains subtle pastel colors while the rock-n-roll set contains more saturated shades. We recognize that in many cases our customers need a new standard light gel NOW. That’s why we carry a large supply of standard light gels, and ship within 24 hours of placing your order. We make it easy to order online and allow you to view all of your past orders in case you want to do a quick re-order. Wybron has a long history of excellence and our standard light gels are assembled using the same high standards as all of our other products. We understand how color contributes in conveying mood, time of day, and place during a performance and how it is used to tell a story. That is why we first developed our innovative scrolling color changer and why we continue to manufacture our own gel strings. Wybron works hard to design products that give our customers more creative options and flexibility when using our equipment. We provide detailed information on all of our products including troubleshooting guides, fixture compatibility, and capacity. Please contact us if you need further information. Wybron is the leading manufacturer and inventor of professional stage lighting equipment that has changed how the industry looks at the art of lighting. We pride ourselves on developing and engineering products that outperform in reliability, quality, and superior design. 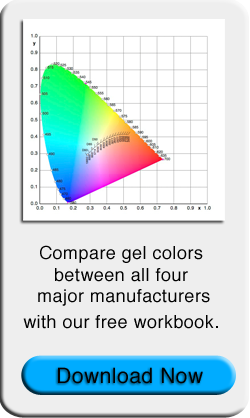 We employ the same standard of excellence in assembling our custom and standard light gels.